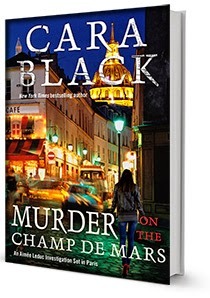 Murder is Everywhere: It's publication day for Murder on the Champs de Mars! It's publication day for Murder on the Champs de Mars! Well, at least they snooze and get comfortable on it. Congratulations, Cara! Watch it move up the best seller lists! Congratulations! What a terrific promotion! My cats usually find a way to get between my eyes and whatever I am reading. Nothing could possibly be more important to me than they are. Congratulations, Cara, on having a household filled with discerning readers! And of course, viva "Murder Champ de Mars!!" I'm not sure whether I'd prefer to have my pets sleeping on my book or sitting on my book... hmmm. So, all kidding aside, the book's about the first serial killer on the red planet, huh? Radical. Of course, if Jeff had written it, it would have to have been titled something like, "Ares, Killer King of the 4th Planet!" Hmm? What? Oh... it's Murder ON THE Champ de Mars. So... why would someone murder someone else ON the champion of the Red Planet? I am just SO confused. :-) Tous mes meilleurs voeux pour vous, Cara! Congrats, Cara. I have tweeted the good news and posted it on FB! Huge congratulations, Cara! Long may Aimee -- and you -- roam the dark streets of Paris!